At Premier’s we follow what Steve Prefontaine had once said regarding gift .To give anything less than your best is to sacrifice the gift. We also believe that when it comes to gifts, one should not give anything less than one best, for anything inferior amounts to spoiling the gift or even worse, not giving it at all. This philosophy has driven us to prepare our Gift Packs with utmost care and delicacy, so that they look beautiful from all angles. 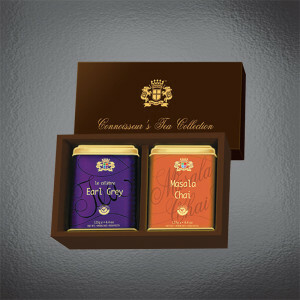 Be their external appearance, packaging, and quality of tea packed inside and interior of the packs. At the end of our endless research and relentless efforts to design and create exclusive Gift Packs, we now have some exclusive series of Gift Packs, which are visually soothing, tastefully designed and delicately packed. They are all elegance personified – And as for teas, tasting is believing. Our PMS, series of Gift Packs are a delight for any connoisseur as well as for receiver of Gifts. 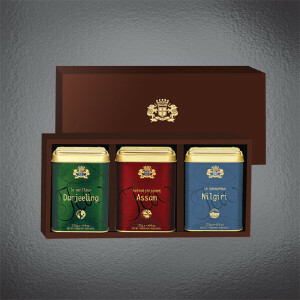 Available in various combination of 3 Caddies such as Pure Darjeeling, Darjeeling Green, Pure Assam, Nilgiri, English Breakfast, Earl Grey, Chai and Masala Chai. Available in various combination of 2 Caddies such as Pure Darjeeling, Darjeeling Green, Pure Assam, Nilgiri, English Breakfast, Earl Grey, Chai and Masala Chai.